To interact with the VM guest OS, Veeam Backup & Replication needs to deploy a runtime process in each VM. The task of deploying the runtime process in a VM is performed by the guest interaction proxy. The guest interaction proxy allows you to communicate with the VM guest OS even if the backup server and processed VM run in different networks. 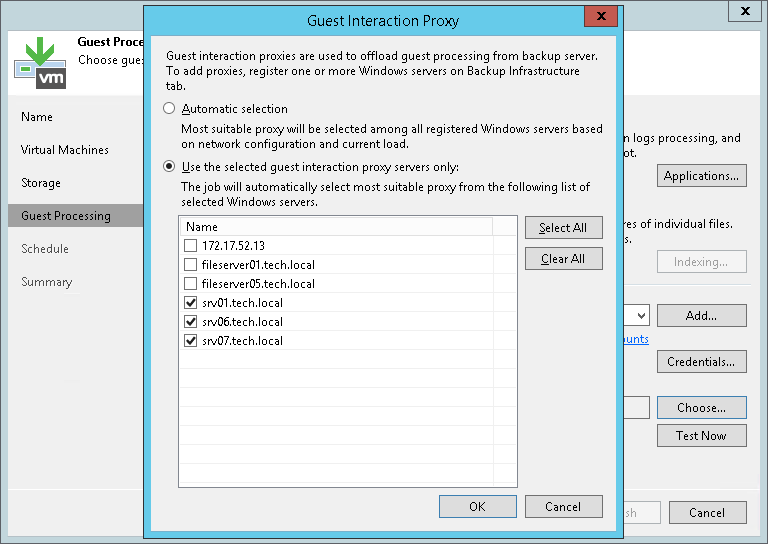 The guest interaction proxy deploys the runtime process only in Microsoft Windows VMs. In VMs with another guest OS, the runtime process is deployed by the backup server. You can use multiple guest interaction proxies to improve performance. Multiple guest interaction proxies will deploy runtime processes in VMs faster compared to the same operation performed by one guest interaction proxy. In a backup infrastructure with multiple remote sites, you can deploy a guest interaction proxy in each site. This can reduce load on the backup server and produce less traffic between the backup server and remote site. The role of a guest interaction proxy can be assigned to a Microsoft Windows server (physical or virtual). Guest interaction proxy must have either a LAN or VIX connection to the VM that will be processed. You do not have to set up both connections — only one connection is required. For more information about setting up a connection to the VM, see https://www.veeam.com/kb1788. The guest interaction proxy role can be performed by any machine that meets the requirements, including backup proxy, backup repository, WAN accelerator or backup server. The guest interaction proxy functionality is available in the Enterprise and Enterprise Plus Editions of Veeam Backup & Replication. When you add a Microsoft Windows machine to the backup infrastructure, Veeam Backup & Replication deploys the Data Mover Service on it. The Data Mover Service includes the components responsible for runtime process deployment during guest OS interaction. A machine in the same network as the protected VM that does not perform the backup server role. A machine in the same network as the protected VM that performs the backup server role. A machine in another network that does not perform the backup server role. A machine in another network that performs the backup server role. If Veeam Backup & Replication finds several available machines of equal priority, it selects the less loaded machine. The load is defined by the number of tasks that the machine already performs. If the guest interaction proxy fails to connect to a Microsoft Windows VM, the guest interaction proxy will not be able to access the VM and deploy a runtime process in it. In this case, the backup server will take over the role of guest interaction proxy and deploy the runtime process in the VM.